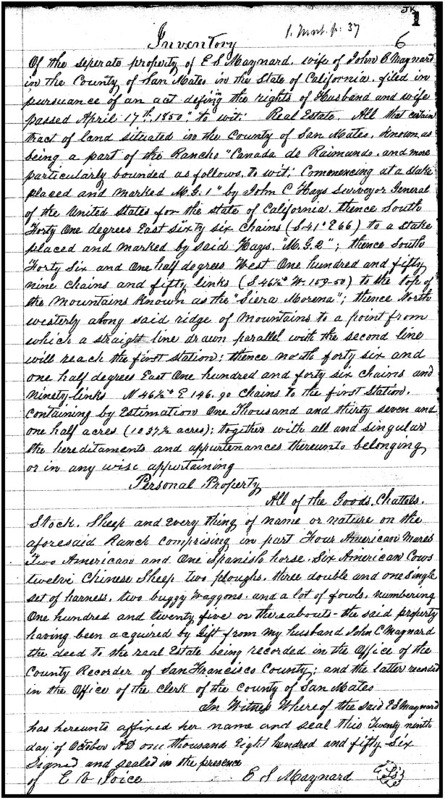 So last week The Legal Genealogist tackled the issue of California’s sole traders — women who, under an 1852 law, set up to do business in their own names even though they were married.1 That prompted a question from reader Stan Mitchell. This sounds like a really interesting set of records. How accessible are they? Did the inventory have to filed on marriage and updated whenever there was a significant change (gift, etc.) or could it be filed at any time? Would a copy of the inventory be part of probate or divorce proceedings? Accessibility is going to be hit or miss, B.G. 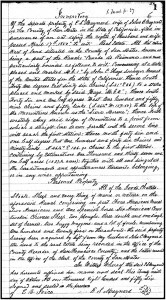 Stan Mitchell in his comment today notes that these records aren’t accessible in Contra Costa County, while San Mateo is online at FamilySearch and the Family History Library has some microfilm from at least San Benito, Alpine, Sacramento, Orange, Fresno, and Butte Counties. There’s nothing in the law that says when the inventory had to be filed but it makes sense that it would be filed — and refiled — whenever there was a major change because ONLY the property listed in the filed inventory was protected under section 5 of the law. And it very well could be part of the record (or at least a copy filed) in either probate or divorce proceedings, so it’d be a good idea always to check! Thank you for that excellent posting (it was very much worth waiting for). My ancestor had a previous marriage and I suspected that whatever property she retained from that marriage was recorded as hers separate from her husband. Your explanation of California women’s property rights confirms that. She also had a son from the first marriage and I thought she might want him to inherit that property on her death. Unfortunately, the Contra Costa County Recorder’s office has not been able to locate my ancestor’s “Wive’s Property” record (circa 1858). It is listed in the Recorder’s general index, with page and volume. That heightened my curiosity about what it might mean. You’re most welcome, Stan, and thanks for a great question. Good luck getting Contra Costa County to find this record for you! I live in Contra Costa County also. Check the CC Historical Society in Martinez. They have a list of databases on their website. Thanks for that lead, Lisa! Thanks so much for the additional insight on California law, Paul! In the Oregon Territory, not only did women have a right to their own personal property after they married, they also owned, in their own name, one half of the donation land claim. A single man (white or not over 50% Native American, over 18) could claim 320 acres of free land; a married couple could claim 640 acres, but one half of that would belong outright to the wife. Women’s property from before marriage was recorded in each county in “Married Women’s Property Registers,” and was hers to dispose of. Oregon’s path to those laws was a little different from California’s, Susan. In some ways it was behind California; in some ways, way ahead of California, but you’re right about where things ended up. Worth another blog post down the road for sure! Thanks for your input!